Among the world’s 2,000+ scorpion species we find an astonishing diversity of fascinating creatures, many of which make hardy pets that adjust well to small enclosures. Several reproduce readily in captivity – lucky scorpion keepers may even be treated to the sight of a female feeding her offspring with crickets! 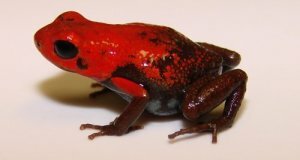 At least 15 species are established in the pet trade, and specialists are working with several others. At 8.5 inches in length,the South African Flat Rock Scorpion, Hadogenes troglodytes, is the largest scorpion regularly seen in captivity. It is exceeded in size only by India’s 10-12 inch-long Giant Forest Scorpion, Heterometrus swammerdami. The largest North American species is the 4 inch Florida Bark Scorpion, Centruroides gracilis. Today’s giants are dwarfed by the ancient Sea Scorpions…some were larger than a person (please see article below)! 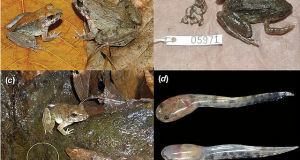 On the other end of the scale, several in the genus Microtityus are a mere 0.3 inches long. Most scorpions feed upon a variety of invertebrates, but some specialize in catching land snails and other scorpions. Frogs and other vertebrates are sometimes taken by large individuals. All scorpions produce live young, and some are parthenogenic (reproduce without mating). Females often carry the young on their backs, and several species feed them with shredded insects. Emperor Scorpions and others exhibit complex social behaviors. Scorpions are found on all continents except Antarctica, and live in deserts, grasslands, caves, rainforests, human dwellings and many other habitats. A surprising number thrive in temperate climates, ranging as far north as Canada; 90+ species inhabit the USA. They are frequent stowaways…I was once called to Kennedy Airport to collect a scorpion that had stung a customs inspector as she checked luggage. Scorpion venoms are complex, and are being studied for possible use in the treatment of Lupus, cancer, MS and Rheumatoid Arthritis, and as pain-killers and insecticides. Most of the 25-30 species capable of delivering dangerous stings are classified within the Genera Centruroides, Androctonus and Tityus. Scorpions are nocturnal, but captives often emerge to feed by day. Due to peculiarities in molecular structure of the exoskeleton, scorpions fluoresce (“glow”) under UVB light; scientists have not determined what purpose this serves. Scorpions are best kept in screen-covered aquariums or plastic terrariums. A 10-15 gallon tank is usually adequate for a single adult or pair. Scorpions need a dark hiding spot. Burrowers such as the Emperor Scorpion will dig their own retreats if provided with deep substrate. Arboreal scorpions will hide behind an upright piece of bark, while South African Rock Scorpions prefer narrow rock crevices. Most also accept inverted flower pots and plastic caves. A mix of coconut husk and peat moss works well for rainforest natives. Burrows will stay intact if you add just enough water so that the substrate sticks together when squeezed. Arizona Hairy Scorpions and other desert-dwellers can be kept on a sand/gravel mix. 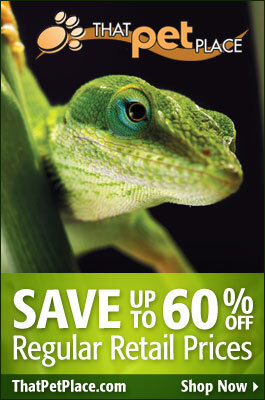 Reptile night bulbs will allow you to watch your pets’ nocturnal activities. Most scorpions do well at temperatures of 78-86 F (please write in for individual species details). Reptile night bulbs or ceramic reptile heaters can be used to warm the terrarium. Heat pads are another option, but these warm the substrate more than the air. Any heating element may dry out the terrarium, so it is important to monitor humidity. Rainforest species require humidity levels in the range of 75-85%, while those from arid habitats do best at 40-50% humidity. Desert-dwelling scorpions spend most of their time in moist burrows, and should be provided a cave stocked with damp sphagnum moss. Emperor Scorpions and several others live in social groups that occupy a single burrow system. However, females with young may become aggressive…please write in for further information. If given enough space, a scorpion colony will establish a complicated maze of burrows. Most scorpions will thrive on a diet comprised of crickets, mealworms and earthworms, but they should also be offered roaches, waxworms, and other invertebrates. Pink mice are not required, even for the largest species. Once adjusted to their homes, scorpions will often accept canned grasshoppers and snails from feeding tongs. Powdering food once weekly with a reptile vitamin/mineral supplement may be beneficial. Scorpions obtain water from their prey, but should also be provided with a shallow, easily-exited water bowl. All scorpions produce venom and can deliver a painful sting. While those commonly sold in the US pet trade are not known to have caused fatalities, dangerous species have appeared, either accidentally or purposefully. Also, a serious allergic reaction to any venom is possible. Purchase scorpions only from reliable sources, and be sure you can identify those you are considering. Scorpions adjust well to captivity, but cannot be “tamed” or “trusted”, and should not be touched with bare hands. Move scorpions by urging them into a clear container with long-handled tongs, or by inverting a container over the animal and sliding the cover below. Lifting by the “tail”, or telson, places you in danger and can injure the scorpion. Hey, ive got 4 small emperor scorpions and in the last 24 hours one has gone into a molt and seems to be stuck, not sure theres alot I can do for it so im going to have to freeze it, im wondering if its anything to do with my setup? Spiderlife substrate mixed with some vermiculite to help hold moisture. Theres 4 cork bark shelters and they are mainly fed crickets. Unfortunately, scorpions that become stuck in a molt are difficult to assist. Try covering the screen top with plastic and spraying heavily, but at this point it is not likely to help. Manually pulling of the exoskeleton is not an option; the new exoskeleton will not have hardened properly, and stings are still possible as well. Difficult sheds can be caused by overly-dry conditions or lack of a moist shelter or burrow, or disturbance by people or other scorpions just prior to the shed. Sometimes it is related to underlying health issues of which we know little, unfortunately. Your set-up and humidity levels sound fine. 23 C (78 F) is right at the lower limit of their preferred temperature range; they often do fine at that temperature but raising it a bit would be preferable; immune system may operate more efficiently, etc. 27 C (86 F) is the upper limit; 25-26 C would be ideal. You might also try stocking the shelters with damp sphagnum moss, so there’s always an extra-moist area available. Providing substrate deep enough for burrows, and partially burying caves within the substrate, is also useful. Since you’ve provided the scorpion with a good habitat, I would guess that the trouble is either due to a disturbance just prior to the molt or an undetermined health problem. Yeah ill have to get another heater I think, its fine in the summer but right now its -9 outside and the tank is at 21, but the heaters have just come on with a timer, im going to euthanise the scorpion because theres definatley nothing I can do now. Also I do have sphagnum moss but I find it just dries out really fast, any tips? Thanks for the feedback. Temperature could be involved; perhaps it dipped at night while the scorpion was starting to molt; it’s a very complicated process, as you can imagine…I’ve found various inverts “stuck” in the wild as well; conditions must be just right. Not sure what you are using, but ceramic heat emitters, as sold for herps, are useful, and do not emit light. Let me now if you need details or links to products. Heaters of any type will dry substrates. Sphagnum can hold a great deal of water; if you soak it in a bucket of water for awhile before using it may stay damp longer. Locating moss-filled caves below the substrate will also help slow evaporative loss. Hi Frank. 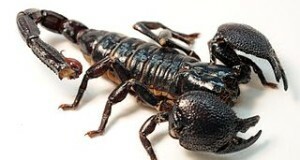 Do you know of anywhere I could buy an Indian Giant Forest Scorpion? I don’t have any sources right now…I’ll keep an eye out. You may be able to put in a request with some of the invertebrate suppliers on Kingsnake.com as well. hello frank i have a young emperor scorpion and his tail seems to be stuck in his old molt its barely been a day sence his molt, the old skin is soft and it seems as if he is trying to remove it but attempts have been unsuccesfull is there something i can do to help should i wait till his new exoskeleton hardens before i attempt aiding him? thanks frank ive done that reasently i also heard baby oil could help and he has done some attempt to remove it, unfortunatly its still stuck there. i covered the lid with plastic now and about how long should i wait till attempting to remove it? its been three days sence he moulted. Hi Frank. I am trying to be prepared for when my Hadrurus arizonensis starts to molt. You mentioned the Sphagnum moss for some, but would this be advisable for desert scorpions like mine? I’m afraid this may be TOO damp. I also have a desert hairy, he moulted just before I got him and I’m just waiting for the next, I’ve been wondering should I keep a full water bowl in there or just fill it once a week? hello frank all seems to be going well he sheded most of the molt now and there is only a small fragment stuck on his tail but its in a place that it should not bother him because his stinger is free he has been eating very well and i have found allot of white spots on the tank i removed the cocoa fiber and placed new fiber (thinking it might be a fungus) and the spots are still there i heard scorpion poop is white so im not all that worried i saw some on his face today i whipped it off with a q tip……. my question is if it is a fungus and not poo what can i do to stop it? thanks frank as always very helpfull and well one last thing for now i heard that the bigger the terrarium and the tipe of food and amount of it consumed has allot to do with how big my pet will grow is this true? Glad the info was useful., Diet will affect growth rate, but ultimate size seems determined by species specific limitations; also, various populations differ within the range…some never get as large as others. terrarium size is important for health, breeding success, but seems not to affect size (no specific research re this, however, as far as I know). hello frank all has been going well my scorpion is fat and has been very slow lately, i know this is normal but to my surprise this morning i found what seems to be baby pin head crickets in his tank im not sure what to do with them or if in any way they can harm my scorpion while he molts should i remove them or are they no threat? hello frank this morning my scorpion finifhed his molt however his sting is no longer there a white fluid has been leaking from where his sting usto be it looks allot like …well poo but im not sure what it is he moves his tail and everything but im not sure if he can survive much less grow back his sting what should i do if there is anything too do? Hi Frank … I’ve written to you before about my flatrock scorpion (H. troglodytes), Fury. Probably under a different article heading, also dealing with scorpions. Sadly she passed away earlier this Summer, but I thought you might find it of interest that she was *at least* 15 years old at the time of her passing. I acquired her in 1999 – or perhaps even the year before, I don’t recall that for certain – but I know for sure that I had her in 1999, because I had a friend visiting from England that Summer, and I remember him commenting on her. So I had her for 14 years, and she was a full-grown adult import when I got her. So I’m adding *at least* 1 more year to her lifespan to allow for growing to adult size (I imagine for such a large species, and in the wild, it takes longer than that). She outlived two males and never did reproduce for me, unfortunately. I was sad to lose her, but I know she lived a good long life. I’m still not seeing this species imported anymore; I do see H. paudicens with some regularity, but no one has troglodytes. It’s a shame, because they are impressive. At least I got to share my life with one for quite a number of years! Frank, I have a 140 gallon tank (we are using as a coffee table) that needs a top. Its shaped alittle different as well so I’m trying to figure out a creative but not costly way to create a top. I have a few choices, metal or hard plastic grades with holes already cut that I will have cut to fit aquarium. I will also cover the ends all around tank with a sturdy Plexiglas. The middle will be the air holes to breathe But then I come across a heavy duty rubber floor mat with holes. Can scorpions chew threw rubber? The company who makes them, makes them for large plants or warehouses who manufacture for many businesses. I plan to house 2 Asian scorpions, male & female and eventually breed. If I place 1 heat spot bulb in the middle of cage will that be enough heat for the both of them. I’m figuring that the heat will be in center as the cool sides will both be on opposite side from each other. Also to create their own separate space. If that sounds okay by you, another question would be, according to the size of tank which is 140 gallon, 4′ length by 35″width what would the appropriate setting for the thermometer and humidity be set on? I have the proper dirt, moss, vermiculite on the way. I do have a fog machine with a hand mist sprayer that will also help with the humidity. Is there a certain kind of water I need to use to mist with? One more thing before I go. I have already bought cricket foods for the crickets I’m planning on raising as well. Now these gel crystals can they also be used as as a water supplement for the scorpions? That’s all the questions i have before i set up my aquarium so i can get 2 wonderful reptiles. Thank you if you can help in anyway. Sounds like an interesting project, hope you enjoy. They do not chew through rubber or other materials. No real way to suggest settings for the thermometer…this will depend on what you are using to heat the tank, household temperatures , substrate depth etc…some experimentation is always needed, ; best to do this before you get the animals. Black/red night bulbs and ceramic heaters are useful after dark, and will help you to observe them as well. You can fine tune humidity with a mister and by adding water to the substrate. You didn’t mention the species…let me know when you have this info, and we can go over temperature ranges, etc. Some scorpions use gel cubes, etc., but it’s preferable to provide a shallow bowl of water. Crickets are easy to feed, but difficult to breed and raise (if that’s what you had in mind). Be sure to offer some of the other foods mentioned in the article if possible. Nice to hear from you and glad the scorpion is doing well. growth varies with diet, temperature and individual characteristics…there’s variation across the natural range also, so it’s very difficult to generalize; no need to worry about growth rate, all is well as long as it is feeding regularly; most pets get too much food, grow too quickly, etc. If it is Mastigoproctus giganteus: that species is found from Texas into Mexico…seems limited to moist habitats within tha range, but not well-studied; may be in Fla also. Hissing roaches are fine to use, although you’ll likely need to stay with small individuals as adults are well protected by the exoskeleton. Orange-spotted roaches are soft-bodied and breed rapidly; please see here. Hey frank, sorry to bother you but out of the nothing my scorpion past away today, :'( could this have been caused by him not being able to get out of his molt? I had his humidity up to 80% and the temp was in the 90 region (do to mexicos warm weather) is there any other factor or something that i did wrong??? He was wriggleing around earlier today and lately he had been really lazy and inactive but every now and then was really jumpy climing amd exploring his enclosure,…..what could have gone wrong? Again its me, apperantly he is still alive, it doesnt seem like it however he hardly moves i stimulated him put him on his back and tickled him and nothing but my mom touched his back just now and he began to move! What is going on?! So if he wasnt able to split the old skin will he be able to try again? Or is it like a one shot one chance kind of thing? He seems to be doing well just real lazy i checked up on him all night, im guessing its just a waiting game now, im just curious if he will continue to try to split it or will he just wait it out? Hi Frank. I have a feeder question for you. I know I am supposed to keep my scorpions died varied, but my scorpions seem to prefer crickets. About a month ago even though I had been offering red runner roaches and super worms they hadn’t eaten in about two weeks or so. Then I went and got some crickets and 4 out of five of them ate immediately when I offered them. Every once and a while they will eat a superworm but they seem to prefer crickets 80% of the time. Is there anything I can do to get them to eat something else, ESP roaches? Do scorpions ever stop molting when reached adult size? I have a big Parabuthus that did not shed over a year now. It only seems to get fatter. It’s quite healthy but a bit restless for a month now. There is enough water and moist for I thought it was molting time. Good question, and good policy re feeding…they are primed to eat as much and often as possible. Shedding may vary among species, but most shed very infrequently as adults; some may not do so at all. Mainly done in order to”renew” exoskeleton…repair injuries, etc; control parasites, fungus. Thank you for the useful answer, Frank! What ever the case my be, the scorpions never seem to be affected by these and maybe even these tiny critters serve a good cause…? Thanxzzz for your wonderful blog. Dear. Sir have a 30 black scorpions but wait is 7 to 10 grams do you advice me what should i do they wait is grow speedy? And scorpions must need a water? is scorpian is allowed as a pet in india also? I have a question (or a few) about a Striped Bark Scorpion or Texas Bark Scorpion I found in my house. I live in Oklahoma btw. I am thinking about keeping it, but the information I’ve found online so far hasn’t really helped much. I know very little about scorpions since I never knew that people actually kept them lol. What would be best to keep him in? What kind of substrate should I use? Should I even keep it? What kind of heater/temp would be okay for him? And finally what should I feed him? So far I’ve been feeding him termites cause we have a lot where I live. Scorpions are very interesting but do have some drawbacks the species you mention is not considered dangerous to most people, but an allergic reaction is always possible…as with bees or any other venomous animal, such can be very dangerous or deadly. Children and elderly or immune -compromised people are also at risk from any sting. They are escape articts, able to squeeze through tiny openings. Or you can use a plastic terrarium designed for use with insects and equipped with a locking top ..be sure air holes are tiny…they have live young, which are very small. Never handle scorpions,…they cannot be tamed or habituated to people. Care for this species is simple..termites are a good food, or any other small insect, including crickets sold by pet stores, waxworms etc. Normal room temps usually fine for winter, although it will slow down if temps dop into mid 60’s. You can use a small incandescent bulb for heat if need be...red/black types or ceramic heaters are good for nighttime use. Sand or a sand soil mix is fine as a substrate; add bark or a small cave as a shelter; mist lightly once each day. The following articles provide natural history info on this species and general scorpion care details. My 3instar heterometrus longimanus were just recently infested by harmful mites. But thanks to your suggestion of luring mites by using fish flakes, mites started to decrease on my scorpions. It took me like a month to eliminate the mites but it made my scorpions mite free. Thank you very much sir. Hello Frank.I got my three h.longimanus 4i in a week and they dont want a food when i offer it. the 2 scorpions seems alittle fat unlike the other one.Its thin.How can i feed it? The temperature is ok as i see on the internet.The enclosure is 6x12x6.It has a rock and a branch like wood lying on the substrate.I want to feed them a b.lateralis but is seem to ignore it.I you want some picture.I send it to your Yahoo. This species is considered to be social, but not all individuals get along…perhaps they are stressed, fighting at night/ Adding deep moist substrate into which they can burrow can be useful, as well as providing more hiding spots and a larger tank so they can spread out, avoid one another. be sure to keep humidity up around 75% or so. i didnt see them fighting.They keep digging the substrate where the the rock is place and my 3 scorpion always there in a burrow.So you telling me that they need to seperate? sorry for my english Frank. I just got my first scorpion two weeks ago (Asian forest) and it of course was under some stress from moving homes. It has underwent his first two molts. Terrarium is currently at 82 degrees and 75% humidity. He has became unstressed and began a little burrowing as well as getting into a good sleep cycle but will not eat his crickets that he ate before I got him. Whether I let one run in the cage overnight or I hold it wiggling in tweezers, he doesn’t seem interested. Starting to worry me. Any suggestions? Frank, we recently found a small scorpion in our Vegas house. I have two love birds. Will scorpions climb up a large cage and enter it? Thanks so much for your reply. Thanks for the information. So they don’t really need the lighting? I bought a 25 watt red bulb and put it in the heat lamp. We put some sticks and foliage in there, but not high enough for him to reach the screen lid. What do they typically like for hiding in/under? Thanks for all your time and help. I’ve gotten some really valuable information. The screen we bought has cage clamps, so I don’t think we should have any trouble. What is the best things to feed them? I went outside and caught a few of the black crickets that’s all over here, but I dunno what’s best nutrition wise. Hi Frank, it’s me again. I was wondering, do Striped Bark Scorpions make nests? I was going to clean the cage out some and I lifted up a medium sized piece of bark that we put into the tank and he was underneath it in a little round white circle. Is it mold, or is it a nest he made? Ok I was just wanting to make sure it’s not mold. He seems to be adjusting well to the environment. He has already eaten a large cricket about 3 days ago. After I got the light he seemed to get more active. What’s the best type of mixture for the tank? Right now I have a sand/peat moss mixture and some pebbles with fallen branches and other pieces of foliage we got out of the back yard. Should I remove the branches as they start to die or just leave them and add more as those start to die? If you live in a warm climate, like in Florida, is a heat source necessary? Maybe during the winter but currently it’s 88 degrees and it’s only march, probably will have to turn the A/C on for him! Everyone keeps insisting that i will need one but I’m not so sure so figure I would ask before I purchase an emperor scorpion. Hi here I’m new to keeping a scorpion as a pet but I really enjoy to have them as my pet . I have 2 Asian Forest Scorpions which is quite young , they length about 6cm . I’m not really sure what’s its species but I know they are in the genus , Heterometrus . Well I’m curious about this : Both of my scorpion is black in colour but their tail ( The stinger ) is milky white color . Can I know why does they have the milky white color stinger ? 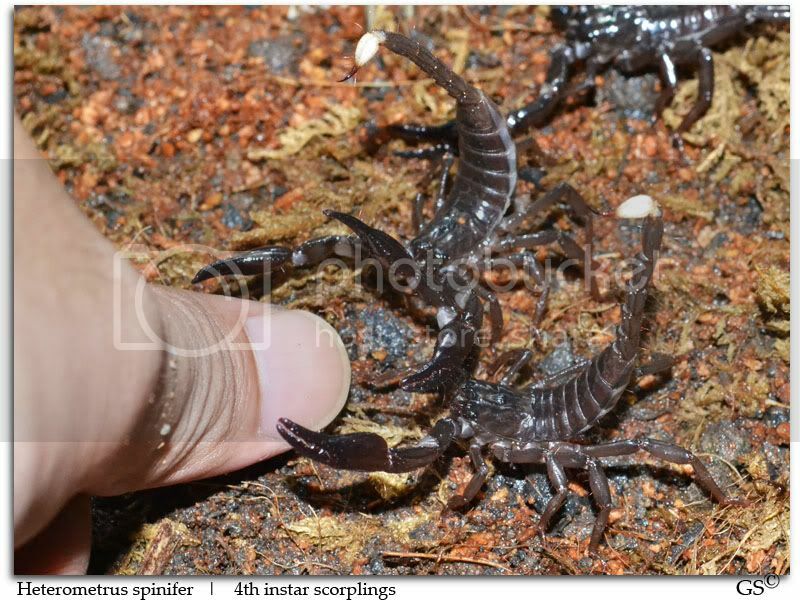 Because as I search on the internet most of the Asian Forest Scorpions doesn’t have a white stinger , can anyone help ? And can I know what’s the species of my scorpion ? Thank you ! I have seen many Asian forest scorpions with lighter colored telsons, especially in juviniles. As you can see in This Picture They sometimes will darken with age. Unfortunately, often times when Asian Forest Scorpions are imported, they are not labeled with their appropriate taxonomic classification. Luckily the internet is full of invertebrate enthusiasts that might be able to help you identify exactly what species you have. I would recommend checking around Arachnoboards.com for further identification info. Hopefully this can get you pointed in the right direction.